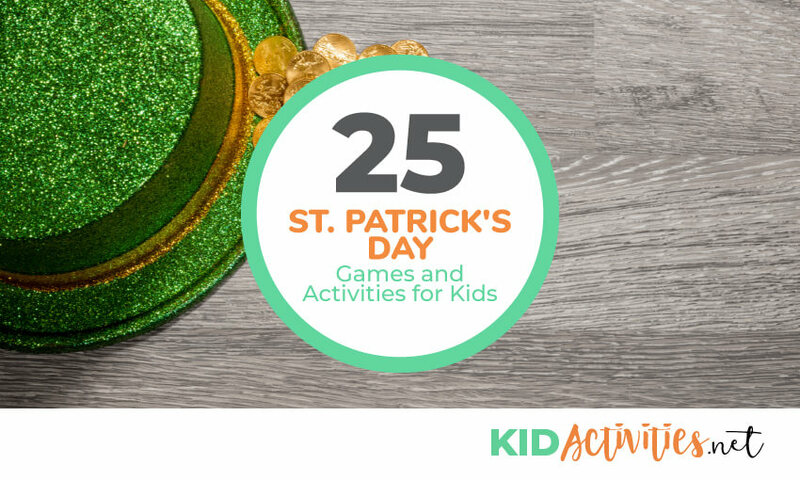 If you need some St. Patrick’s Day games and activities for the classroom, look no further. 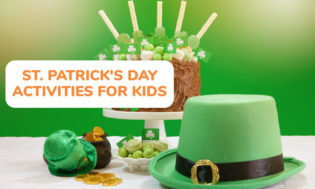 These St. Patrick’s Day ideas are sure to lead to hours of entertainment and bring out the holiday spirit. Paint an old tennis ball green. Set five pie tins on the floor, numbered 1-5. Give each child five bounces to land in the pie tins. Add up the total numbers to see who wins. Divide groups into equal teams and sit them at table or desks that have been pushed together. Pass out a drinking straw to each child. Place 2 inch Pre-made green tissue-paper shamrocks -in front of the first player of each team. Have children clasp their hands behind their backs. At “Go!” the first player picks up the shamrock by inhaling it onto the straw. That player keeps the shamrock in the straw until he/she places/drops it down in front of the next player’s area. If the shamrock falls off, it must be sucked up again–The game continues until each team player has had a turn. 3. TOP OF THE MORNIN! Children stand in a circle around a blind-folded child–who is the “leprechaun“. The tube is in a stretched out arm pointing to the circle of children… Play Irish music and when the music stops the leprechaun stops. Such as: skip, crawl, crab walk, hop, walk backwards, etc. Duplicate the words for the number of Teams you will have playing. (Example: Three teams equal three sets of instruction words. Put the SHAMROCKS at the end of the room in a pile for each team. On go, the first player on each team runs up to the pile and takes a SHAMROCK. They do what the Shamrock shape instructs. When the first players get back– the next players run to the shamrocks–and play continues…Return the shamrocks to the bottom of the pile until ALL have had a turn. Tip: Laminate the shamrocks for FUTURE St. Paddy’s Days. (This game can also be a adapted to other themes such as Valentine’s Day– with hearts instead of shamrocks. Challenge friends to a race of the minds. ♣ Prepare two banners (or as many as you need for each team) that say whatever you want them to say. ♣ Also prepare a set of letters for the same words cut out in two different colors (for two teams) hidden randomly around the area. ♣ Divide the group into teams with captains–the captains sit and wait for their teammates to bring the letters for their banner. If a student is on the “gold” team and sees a letter for the “green” team he/she just leaves it alone. The first team to cover their banner letters wins. 6. IRISH HOT POTATO–A traditional game of hot potato using a real potato. Play the same game using a “BLARNEY STONE” (a regular old rock). Then you show by acting out what you would buy. The others try to guess what you bought, and the first one to guess becomes the new actor. 8. Draw a HOPSCOTCH “course” that ties in with your party theme. ♣ Have children toss a gold coin on the course to play. Need 10 or more players, aged 8 and up, played indoors and outdoors. Hurley is an old game which can be tracked back to ancient Rome, and has been played throughout Great Britain for hundreds of years. However, Hurley is popular in Ireland, and it is believed to be the ancient ancestor to modern football. Players form two equal teams, each taking one half of a gymnasium or a large field. One team begins with a medium sized ball (eg: football), with the object of moving the ball over the opposing teams End, which is simply the rear boundary of that teams half. The defending team may tag an approachable player, whereupon that player must stop and immediately pass the ball, or give the ball up. The ball may be passed or run with, but it may not be kicked and no rough play should be allowed. Essentially the same game may be played indoors, but with a goal, into which the ball may be thrown, and defended by a goalie. No goalie is required for the outdoors version. Source: Thunder Bay Multicultural Association. 10. A game of LEPRECHAUN, LEPRECHAUN, WHERE’S YOUR SHAMROCK? “Leprechaun, Leprechaun where’s your shamrock? Somebody has it in their Pocket! Guess who? Maybe you… Maybe a monkey from the zoo. The Leprechaun opens his/her eyes and has three guesses to who is holding the shamrock behind their back. Whether a right or wrong guess…the child with the shamrock is the next leprechaun. ♣ All Clover’s should have 3 leaves except one, which would be a 4-leaf clover. Children take turns passing around the clovers to music. Tell children that the person with the 4-leaf clover is lucky — that is why they get the special treat. Any “Golden Thought” children wished or makes them happy works! 14. THE LEPRACHAUN LOST HIS GOLD! Let the children find the gold that is hidden about (gold spray-paint items – anything you can think of – rocks, corn pops, buttons, keys, spoons, etc.). 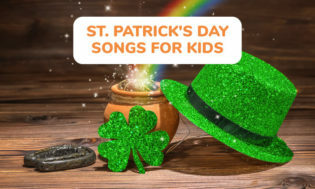 On St. Pats Day, the leprechaun will return and pick-up his small pot full of gold – and in return — he will leave a large pot (a Halloween witch’s cauldron) full of a reward. (Their reward can consist of shamrock shaped cookies, a pitcher of lemonade tinted green, festive cups and napkins, and a goodie bag for each child. You can fill it with whatever you’d like! 15. ST. PADDY DAY PARADE! Great for all ages! I work in a program that has kindergarten kids in the half-day when there is no class for them. We do this for the school–going around the halls and in and out of the rooms….. BUT…..This would also be fun for pre-school! On St. Patrick’s Day the entire school (dressed in green!) gathers. Signs, poster, instruments, hats, etc. are passed out and they hold the annual parade. 16. LEPRECHAUNS INVADE THE PROGRAM! Make mischief! For St. Paddy’s week, when the children go outside to play, turn chairs and tables upside down. Or, when children take naps–the leprechauns switch shoes around. On St. Patrick’s Day the leprechaun should write a note saying he’s sorry for the mischief he has caused. He’ll also tell the children that he has left them a treasure and has hidden a pot of gold for them to find. Kids follow the clues around the center/school, until they find the surprise. 17. MAKE A LEPRECHAUN TRAP! Begin your celebration by building a Leprechaun trap. I read of this a few years ago and it has become a “tradition” in our program ever since. Round up supplies you decide to use…such as a shoe box, pipe cleaners, markers, glitter, construction paper, wrapping paper, tape, glue, egg cartons, etc. Kids will have fun designing the trap, making it, and the anticipation of the day it is used. Can you design one with a trap door? Because Leprechauns are smart and quick–you’ll have to lure them in with something. Maybe a piece of gold coin candy, a shamrock, clover or penny? When I read the original idea–Lucky Charms cereal was mentioned as bait. 1. Leave your trap out the night before St. Patrick’s Day and in the morning the kids will get a surprise! 2.The day before (when you leave work,) put little green foot prints and chocolate coins or treats in the “cage”! A nice touch could be a note saying that he (the Leprechaun) couldn’t stay and needed to get back to the Rainbow)! Have fun with green water! Simply add a few drops of green food coloring to the water-table… it only takes a few drops of color. Add child-safe bubbles as well! Advise to wear cover-shirts but there is no staining of the skin, table or towels. Have each child plant their own green beans. Start well in advance so the beans will start to come up before March 17! ♣ Beans are the color green and the children will love watching them grow. They are also a great way to introduce children to gardening and the connection between food and the earth. You need is bean seed, small garden pot (3 inch across) some soil and water. You will also need a place to put the pot where it will get 4-6 hours of sunlight. Fill the pot with soil; make a small hole using the little finger about 1/4 inche deep–put in the bean cover over, water. Place the pot in a sunny spot and watch it grow. Be sure the planter has drainage and be sure to place a saucer to catch the excess water. ♣ If children are younger–begin or end the activity with READING JACK AND THE BEANSTALK. Also see the three LEPRECHAUN GROWING GRASS ideas in the St. Patrick’s Day Arts and Crafts section! You bring luck my way. On this St. Patrick’s Day! I’m looking for a leprechaun. Made of green, made of green. Hides his gold, hides his gold. He lives by a rainbow and hide his gold. I’m a little Leprechaun, short and green. Another one sprouted, and then there were four. Another one sprouted, and then there were five. 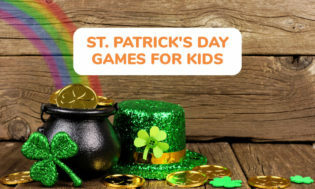 Thanks for checking out our St. Patrick’s Day games and activities. We hope this makes your classroom celebration a fun and memorable day.